I'm a huge Gary D. Schmidt fan, so I was very excited to read his latest book, and it did not disappoint me! This book is definitely on par with The Wednesday Wars and Okay For Now. Carter Jones is going about his chaotic business one morning when a man shows up on his family's doorstep. Apparently his grandfather has died and left the family the services of his butler, with an endowment to pay his salary. Carter isn't sure what to think of the Butler when he starts serving tea with cream and sugar, taking the kids to ballet and art shows, and teaching Carter and his friends to play cricket. However, as other things in the Jones family's lives start to fall apart, the Butler becomes more important to them. If I had any parental notes about this book, I would say that the family is a lapsed Catholic family. By the end they are going to Mass again. If your family is not Catholic, you probably want to discuss that a bit with your kids. The other main note would be for some heavier family-related themes, like fathers abandoning their families, and dealing with the loss of a child/sibling. Schmidt handles these things in a gentle, thoughtful way as the family learns to share the grief in better ways, and also as Carter realizes that the Butler cares about him and his family, which is why he is putting in so much effort to teach him to be a gentleman. I loved this book so much, and there are so many wise lessons here from the Butler, including the phrase he says to the children each day "Make good decisions, and remember who you are." One of my favorite exchanges in the book comes toward the end when the Butler changes the phrase. I just want to cry, it was so good. This is one of those books that I think would cause the elevation of behavior, instead of inciting bad attitudes in kids, and so it's absolutely a winner in my book. Of course, I'm making it sound really heavy, and it was profound in places, but it had plenty of light-hearted moments too. I loved the cricket element, and how the game was woven through the entire story. There is also a semi-humorous portion where the Butler convinces Carter to write a paper on the British perspective on the American Revolution, and his classmates shun him (as I would have probably done too - the Butler clearly doesn't understand the Revolution! ), but it was cute and funny. The book ends so well, and it was just delightful, in my opinion. I highly recommend. 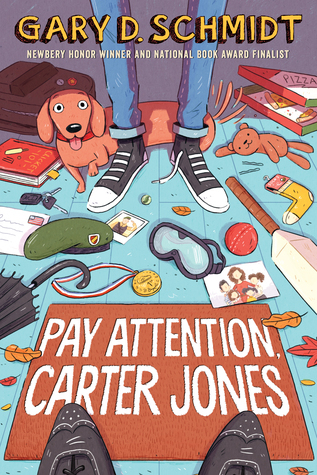 Sign into Goodreads to see if any of your friends have read Pay Attention, Carter Jones.